This recipe delivers a party-sized dish of enchiladas. 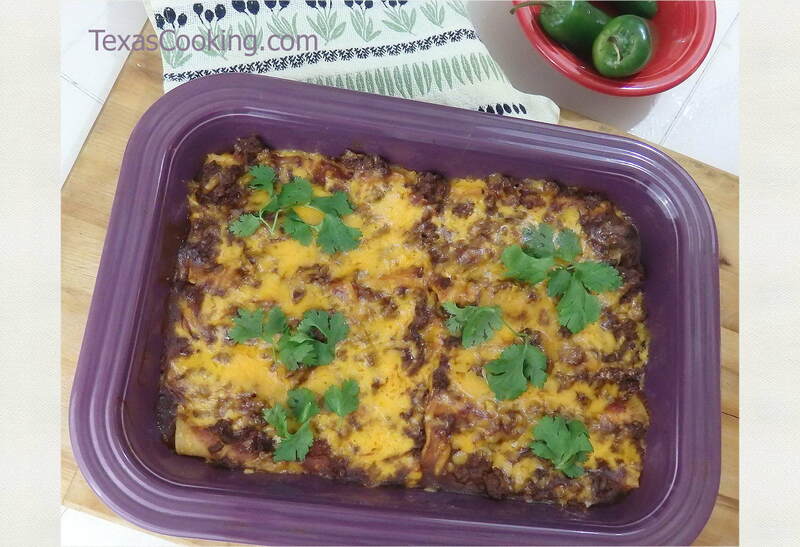 If you've never made enchiladas before, this is surprisingly easy. A food processor for the onions and the cheese significantly reduces the preparation time. It's taken from the Luby's Cafeteria's 1996 spiral-bound 50th Anniversary Recipe Collection book. Preheat oven to 350°F. Spray a 7x11-inch baking dish with cooking spray. The sauce: In large saucepan or Dutch oven, brown ground beef with onions, garlic powder, salt and pepper. Drain. Add broth, tomatoes, chili powder, paprika and cumin. Mix well, breaking up tomatoes with large spoon. Bring to a boil. Reduce heat and simmer uncovered one hour. In small bowl, mix cornstarch and water until cornstarch is completely dissolved. Gradually add to chili sauce, stirring constantly. Continue cooking five minutes. The Filling: Heat about one-half inch oil in small skillet, until hot but not smoking. Quickly fry each tortilla in oil to soften, about two seconds on each side. Drain on paper towels. In large bowl, combine cheddar cheese and onion. Mix well. Spoon 1/3 cup cheese mixture down center of each tortilla. Roll up and place seam side down in two 11 x 7-inch baking dishes. Top with chili sauce. Cover with foil. Bake ten minutes or until hot. Remove foil. Sprinkle with American cheese. Continue baking two minutes or until cheese melts.